Note that there are cheaper alternatives for connecting an arcade monitor to PC – contact us if you are interested. SKU: AVGA. Category: Keyboard Encoders and Interface Hardware. 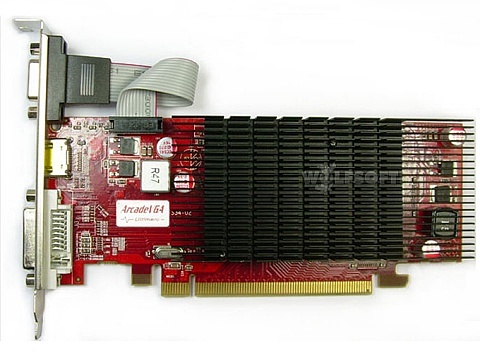 Performance Enhanced RADEON HD5450. Will run SF4 AT 60FPS with FULL DETAIL SETTINGS!! These are simply THE BEST video cards available for connecting a 15Khz Arcade Monitor to PC. You can also connect an ordinary PC monitor and get all the resolutions of the 15Khz monitor plus conventional higher Windows resolutions. INCLUDES CRT AND LCD (DVI) DIGITAL MONITORS. It emulates the original game board’s graphics hardware closer than has ever been possible before, and allows DOS MAME and MAME32 to run almost all games at their native resolutions without hardware stretching scan converters or other degradation. Displays all boot, DOS and Windows screens with NO special configuration or special driver software in either operating system. You have a choice of Windows desktop resolutions including interlaced and non-interlaced modes. Virtual-desktop mode is supported in XP and 2000, so you can run a desktop of 1024 X 768 and auto-pan. No MAME monitor configuration is necessary, no need even to tell MAME you have an arcade monitor. The ArcadeVGA can be connected via J-PAC, Video Amp, or directly through a VGA cable.